A while back, I had visited Las Tortas and struck up a conversation with a total stranger about food. Gee, that's not really a stretch for me eh? Well, I was obsessed with getting the window seat that I had to squeeze by her and then with my picture-taking, it was natural that someone would be curious. I gave her my card and she eventually emailed me some choice restaurants to try. One of them resides on Austin Ave out in Coquitlam. 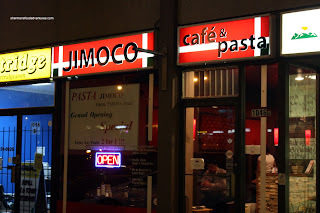 Jimoco Cafe is quite non-descript and I passed right by it the first time. I swung around the block and parked my car in the one of the spaces in this "strip mall". Literally, it's a small strip of stores with a recessed par king lot on a major street. So the "draw" here at Jimoco is the "special" (which has been running since it opened last year) where you can get 2-for-1 pastas. It appears that the special does draw in many different types of customers, from young university students to older couples. Viv and I scanned the menu and thought that they must be kidding about the 2-for-1. Why? Well, the prices all hover around $10.00-$14.00. That means both of us can have our own pastas for roughly that price. That's a freakin' steal! Wait... I guess we really should try the food before we pass judgment eh? 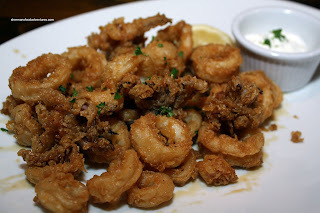 Feeling a little bit guilty of the cheap prices, we added a Calamari to start (isn't it this always the case?). For $6.00, we thought it was cheap (just like X-Site Bistro). However, too bad it was so oil-logged, the plate resembled an abstract piece of art with oil replacing the paint. The calamari itself wasn't too bad. It was tender and the batter decently light despite the copious amount of well-used oil. Unfortunately due to the oil, I would say this was a miss. 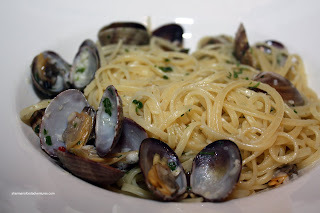 For my pasta, I chose the Linguine alla Vongole and I give them high marks for using fresh clams. However, there was an absence of clam flavour in the dish. I did like the al dente (quite al dente actually) pasta with plenty of garlic and olive oil. In addition to the absence of clam flavour, there should've been a bit more white wine as well. I think adding a bit of clam juice or a touch of canned clams would've helped. 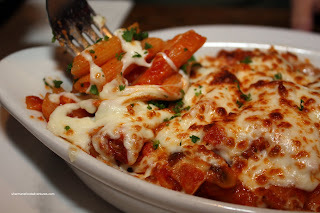 Viv had the Penne al Forno and it was nicely baked with tonnes of oozing cheese. Predictably in this dish, the penne was not as al dente. There was plenty of flavour in the form of bacon and tomato. There was quite a lot of grease due to the large amount of cheese. Overall, this was a pretty average pasta. But whatever the case, for the price we paid, it was decent. Of course if we had to pay the regular prices, I might not be as enthusiastic. Yet, once again, we need to be realistic about our expectations when considering that 2 people could potentially eat for less than $15.00, tax and tip inclusive. - Portions are small; but 2-for-1, who cares? Man, that calamari looks bad. OK, let me rephrase it: it does not look that bad; instead, is the fact all the oil still on top of it. How difficult was it to put it on top of some towel paper (or something on those lines)?! That's a heck of a deal Sherman. Hi Jenny, it's definitely worth checking out. Despite my criticisms, the food is good value and more than acceptable. Yes Kim, the oil was overwhelming on the calamari. They really should've done something about it. Not acceptable. Chris, it's a freakin' steal... especially since some pastas are only $10.00! 2 ppl can eat for under $13.00! Sherman, I know you haven't been back for a long time, but give this place another try. You just have to order the right items. My favs are the seafood risotto (to die for) and the korean spicy spaghetti dish in a hot pot. This place is korean owned and they have their own asian spin on pasta. 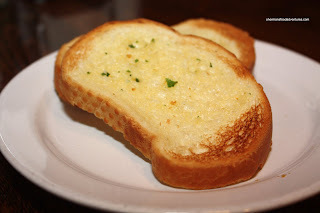 I also love the unending supply of garlic bread. Can't help it because "free" is my middle name.